Sweat poured down G Lakshmanan’s body, small rivulets running down his arms, face, neck, his India vest stuck to his drenched torso like cling-film. Only a few minutes back, in the last race of the day, he showed physical ability that blew away every fan sitting in Kalinga Stadium; even those probably accustomed to observing raw talent. He came into the 5000 metres men’s final with an outside chance of winning, but with a clear possibility of a podium finish. Trailing behind Qatar’s Yaser Salem and Saudi Arabia’s Tariq Ahmed, Lakshmanan showed a kick that not only powered him into first place, but ensured a win with a sprint that would have made his idol Great Britain’s four-time Olympic champion Mo Farah applaud generously. It was India’s second gold on an opening day with terrible technical glitches, a handful of sub-par performances and a shot-putter celebrating her birthday with style — Manpreet Kaur's 18.28-metre throw was good enough for gold and a birthday cake. Conditions were tough at the Kalinga. The high levels of humidity ensured sweat dripped off athletes like a broken roadside tap. Athletes bodies glistened in the flood lit stadium as if they had gold dust rubbed on them. Regardless of whether they won or lost, most athletes did admit the weather was unbearable. It sapped their energy, but they didn’t give up. Indonesia’s Aprilia Kartina was lapped twice in the 5000 metres, but she pushed herself, teeth clenched through the pain as energy reserves depleted. China’s Deng Qiaoling, almost bent over, managed to push herself over the finish line and then hobbled back to the athlete’s area. Amidst all this, scoreboards didn’t fire, showed the wrong timings and false starts dotted the competition through the 100 metre heats. In fact, there was a controversy in the 400 metre semi-finals when Oman and Korea registered a protest on the faulty start of the race. Although it wasn’t confirmed, a few officials did say that the semi-final may have to be run again. 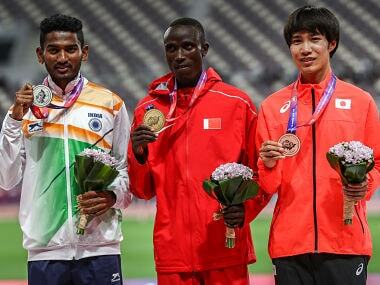 On an evening on which India picked up seven medals, Vikas Gowda failed to recapture his youth. His first throw didn’t light up the stadium; a score of 54.66 metres was evidence of his dwindling form. Although he did attempt a comeback with throws of 58.96 and 60.81 metres, the sharpness and technique that had fetched him two consecutive Asian Athletic golds was missing. Iran’s Hadadi Ehsan won the gold (64.54 metres) while Malaysia’s Irfan Muhammad settled for the silver. Gowda holds the promise of a comeback, but at the age of 34, training can become a chore. "I am planning for the Commonwealth Games and want to finish on the podium at the 2018 Asian Games," he said. Even though he said that he would still try to qualify for the World Championships, given his present form, it will be a rough ride. Kaur, tricolour wrapped around her shoulders spoke about the amenable climate in London and promised to give her best. "I have a month and training is still (going) strong," she said, "But my aim now is to win at the Commonwealth and the Asian Games." With two throws of 18-plus this year and good weather in London, Manpreet could probably over-achieve if she makes it to the shot-put final. Anything beyond that would be a fairytale. "At the moment, I need to call my daughter and celebrate with my family," she said, walking away, eager reporters in tow. While local fans were cheering Dutee Chand who made her mandatory, slightly slow start and then powered home in 11.40 seconds, the fastest in the prelims, Nayana James had started her campaign at the long jump pit with a jump of 6.32 metres. With five more jumps, Nayana was set to at least close out a 6.55 which she had done at the Federation Cup in Patiala. But as the rounds went by, rhythm went for a toss with two consecutive fouls. By then Neena V had jumped 6.54 metres and Vietnam’s Bui Thi Thu had thrown down the gauntlet with a first jump of 6.54. Nayana clearly looked off-colour, tired and just not there mentally. Later on while speaking to reporters, she smiled and said that it’s an achievement to win an Asian Athletic medal, even though it was a bronze, but there’s no mistaking Nayana's missed opportunity to grab a place at the World Championships. Nayana’s coach Ajith Kumar said, "She should have done 6.65 metres and won a place at London. It’s disappointing and I do agree that Nayana wasn’t totally there at the event." Sanjivini Jadhav provided a bright spark on the track when she closed out a bronze in the 5000m. After clinching 3rd place, she knelt and patted the track triumphantly. Earlier in the year, she ran 15:59.17, a timing that would have given her silver on the Kalinga track. Yet, under tough conditions she was delighted with her bronze and a timing of 16:00.24. “I am so happy to have won a medal at the Asian Athletics and now I can plan better as I slowly understand my own potential.” Sanjivini’s broad smile will be seen more often at track meets as the youngster raises her profile on the senior circuit. Disappointment was writ large on javelinist Annu Rani’s face. She came into this competition confident of a 64-metres-plus throw. At Patiala, during the Federation Cup, Annu smashed her own national record of 60.01, with a distance of 61.86 metres. The qualifying mark for the Worlds in women’s javelin was 61.40 metres. But here she couldn’t even touch 60 metres, ending up with a bronze and a terrible throw of 57.32 metres. "The weather was not conducive enough for a good throw," she said, "I wasn’t bothered about the grip but I was sweating too much to be able to focus." Sebastian Coe, the IAAF president and Olympic champion had once said athletics needs to be innovative, braver and more creative and that is exactly how Lakshmanan ended the first day of competition. "I was training in Ooty and then to come here and run in a different weather does have problems but I managed to stay with the lead pack and when I got the opportunity, I didn’t let it go," said the Services runner. 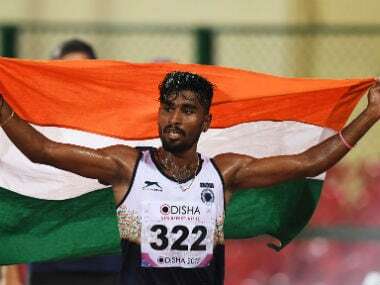 Lakshmanan is known for his 55 to 56-seconds last lap timings and that is what gave him the gold and that absolutely fantastic opportunity to run against his idol Mo Farah. Surender Singh, Lakshmanan’s coach said they had targeted the Asian Athletics and now they would try and reach London by 26 July to get in some training there. "Our aim is to do a 13:25 in London." Lakshamanan believes he is fortunate to be running against Farah. At The Kalinga, Lakshamanan made his own fortune in a punishing arena that saw several others fail.